Use kitchen scissors to cut out the backbone of the chicken and cut chicken into two halfs. You will end up with 4 half chickens (NOTE: you can also cook the chicken whole beer can style, or you can cook chicken thighs). Place skin side up in aluminum foil pan and rest 1 hour in refrigerator until rub “sweats” into the meat. Place skin side up in 275-300 degree smoker with some apple wood chips. Check for doneness after an hour. 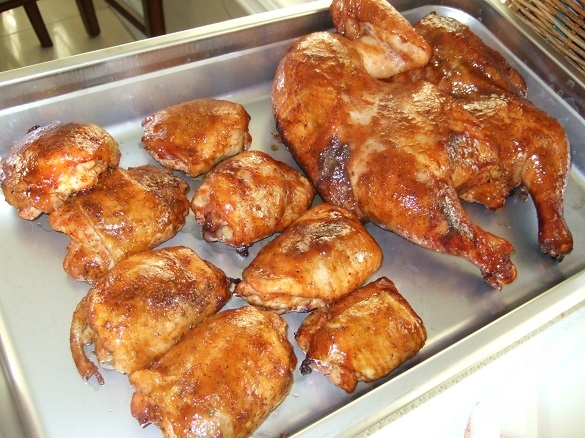 It should take about 60 to 90 minutes to be done depending on how hot your smoker is and where you place the chicken in your smoker. Do not flip or touch the chicken until it is done. Use an instant read thermometer to check for doneness and remove when thigh temperature is 175 degrees and/or breast temperature is 165 degrees. Paint on your favorite BBQ sauce 10 minutes before chicken is done. Would you please share your TOY chicken recipe? I bought your Slap Yo’ Daddy rub pack from Big Poppa Smokers and I want to try your lower internal temp method safely. Do you serve the judges thighs or breasts? Do you foil your chicken? Scrape the skin? How long do you cook it for and at what temp? Help!!! Thanks for getting my new chicken rub. Thanks for your recipes, they are such a blessing! Cook 50 leg quarters and you’re good for 40 servings with some leftovers and seconds. Rest in fridge if you can for 1 hour. Cook in 300F pit (smoke/grill). Cover with foil and keep warm in 250F pit so the skin becomes tender (about 30 mins). Apply sauce and watch it disappear. Thanks-you’re the MAN. But you already knew that. I only have the huge bag of the "love meat tender rub".. ive used it for your chicken recipe 3x now and everyone loterally flips out about how good it is. Is it worth it to get the chicken rub just for chicken? We’re on a tight budget right now and the wife was hard pressed letting me order the meat rub already haha..
My favorite chicken recipe by far!! !